I know fall is all about OMG the pumpkin spice latte! Honestly, I've given it a chance over the past few years, but I'm just not a huge fan of it. I'm a chai spice girl all the way (the tea - not the sweetened, boxed mix). The Kitchn has her own funny thoughts on Pumpkin Spice Lattes as well. Real pumpkin is where it's at. All winter long, my kitchen is always stocked with a few different kinds of winter squash. Let's see, right now I have 2 kabocha squash, 1 delicata, and a bag of sweet potatoes (not squash but still delicious). In my fridge is a half-full can of organic canned pumpkin. Pumpkin is rich in beta-carotenes. When you see orange foods, think carotenoids, which converts to Vitamin A in the body. Beta-carotene boosts your immune system and is essential for eye health. Save the seeds too! Pumpkin seeds (pepitas) are one of the best plant-sources of zinc, which is also an immune-boosting nutrient to keep you healthy all winter along. They contain a wide variety of other nutrients too - manganese, tryptophan, and magnesium. Pumpkins are not just for carving or pumpkin pie. It's fantastic in smoothies, soups, chilis, and even chia seed pudding. 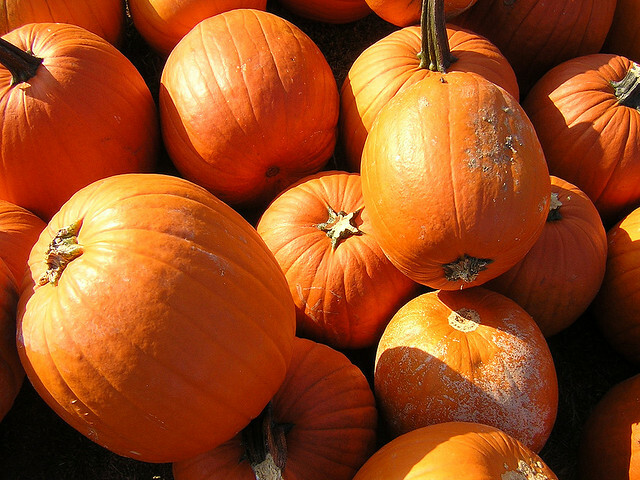 Check out a fall farmer's market, and pick up a pumpkin. Roast it (roast the seeds too), and whip up a warm pumpkin salad, stuff and bake it, or make a soup with it. Here are two recipes I recently made with pumpkin. Blend all together, and serve. Mix pumpkin, chia seeds, almond milk, and spices together, and soak overnight or at least 4 hours. Top it with whatever you would like - yogurt, nut butter, pumpkin seeds, and add maple syrup to sweeten, if you would like. I had this for breakfast, so I added Greek yogurt and almond butter for additional nutrients and protein to keep me full and satisfied! Expand beyond the pumpkin spice latte, and enjoy this super food in its real form this fall! What's your favorite way to enjoy pumpkin? Share below!